The upcoming summit in St Petersburg should finally map out a solution to the global community's main task: stimulating economic growth. As the host country, Russia will place investment at the top of the agenda. As the St Petersburg authorities put the finishing touches to a new purpose-built highway and promise to deal with illegal migrants — and against a backdrop of media speculation that U.S. President Barack Obama could cancel his visit to Russia because of the Snowden affair — the world's leading politicians are readying themselves for the G20. Yet the tone of the September summit has essentially been set already by the meeting of the "F20," which took place in late July. In their final communiqué, the finance ministers outlined three plans of action: examining ways to increase long-term investments; combating tax evasion, and, most importantly, the St Petersburg Plan of Action. The latter will be finalized by September and submitted for consideration at the summit. This comprehensive plan, as stated in the communiqué, is intended to promote growth in the world economy through job creation. A key topic of the summit will be the economic slowdown. The issue concerns not only recession-scarred Europe and the underemployment-hit U.S., but also developing countries, whose GDP growth rates have slowed markedly. "The focus of the summit will be the slowdown in the world's leading developing economies observed over the past few years. Partly it is the result of cyclical processes, and partly a lack of structural reforms," believes Nariman Beravesh, chief expert on macroeconomics at IHS Global Insight. In July, the IMF cut its global growth forecast for the year from 3.3 to 3.1 percent. The figure for developed countries remained unchanged at a paltry 1.2 percent, but the picture painted by the IMF for developing countries was gloomier still: China's GDP will grow not by 8 percent but 7.8 percent, Brazil can expect 2.5 percent (down from 3 percent), and India 5.6 percent (revised from 5.7 percent). Alarm bells are ringing for Russia, too. In July, the country's Purchasing Managers Index (PMI) not only fell (for the first time since August 2011), but was down to below 50 points — the lowest level since December 2009. That followed pessimistic appraisals for the Russian economy from the IMF and the World Bank, which lowered their forecasts for GDP growth in 2013 to 2.5 percent and 2.3 percent, respectively. 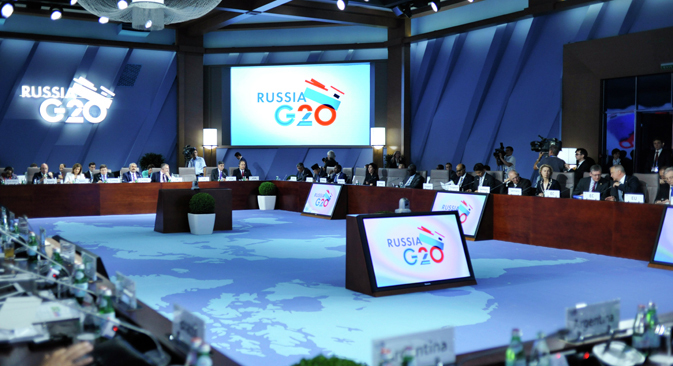 As the chair of the G20, Russia is focusing attention on the need to increase investment to spur a global recovery. As pointed out by the head of the Economic Expert Group, Evsei Gurvich, "Overall, economic recovery comprises two major tasks: how to kickstart the investment process, which drives development, and how to reduce risk through building an international financial architecture and correcting for imbalances that could lead to a new crisis." According to Yaroslav Lisovolik, chief economist at Deutsche Bank, a core challenge for the G20 is the creation of institutions to manage investments. In the words of economist Dmitri Polevoy of ING Bank, greater control is required to ensure that investments are effective, on top of changes in government policies to support investors. Another crucial issue to be discussed at the G20 is the "de-offshoring" of the global economy, including coordinated measures to combat tax evasion. According to Lisovolik, "It is imperative that all countries play ball, and do not seek to channel financial flows." The fight against tax evasion is closely linked to anti-corruption policy, which is also on the agenda of the upcoming summit. The plan — initiated under Russia's presidency and set for further development after the handover to Australia — provides for coordinated action to ensure the independence of anti-corruption agencies, introduce measures to tackle money laundering and the proceeds of corrupt activity, and impose restrictions on the movement of public officials found guilty of corruption. Politicians expect the business community not to remain on the sidelines. Besides the above, Russia has "inherited" other issues from previous G20 meetings that will not escape the attention of the world's top politicians: in particular, the ongoing reform of the international financial architecture and financial regulation. For instance, the revision of IMF quotas in favour of developing countries was approved by the G20 back in 2010, but the reform has since stalled, causing anxiety chiefly among the BRICS countries. Meanwhile, the heated debates of 2011-2012 over the "currency wars" have lost their edge. Prior to Moscow's presidency of the G20, universal fears had been stoked by the stand-off between China and the U.S., as well as Brazil's exchange rate interventions. But the lack of criticism at previous G20 summits over Japan's easing of monetary policy, which has significantly weakened the yen, effectively sanctioned the use of loose monetary policy by central banks everywhere to achieve the main objective of stimulating economic growth.